As the designer of the Rockstick Mouse, I understand the pain and annoyance of Carpal Tunnel Syndrome (CTS). I started suffering with CTS back in 2002. I used to enjoy spending time playing chess games on the computer. But as a result I developed CTS. After years of suffering with strong pain in my right hand, I had to learn to use the mouse with my left hand. Then, within months, I was suffering with serious pain in both of my hands. It bothered me to stop one of my favourite pastimes when I couldn’t play chess games on my computer anymore.? Eventually, I could no longer continue my office job because the pain in both of my hands made it difficult to click the mouse with my fingers or use a computer. Even though I have a Master’s Degree in Economics from the San Diego State University, my inability to use the computer for extended periods of time led me to a series of laborious jobs such as loading and unloading in the Vancouver UPS warehouse. During that time I began to conceptualize and design a new mouse! I started thinking about a hand-held device that would alleviate my pain and prevent others from the debilitating effects of CTS. I wanted to play chess again! 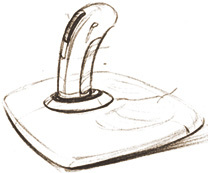 The Rockstick Mouse was developed as a result of years of hard work and the help of professional ergonomists. And I’m happy to say that it works! I still can’t beat the computer at chess but at least I’m back in the game.